Every Thursday at midnight, availability will be loaded for the weekend. View a map of Two Harbors Moorings. A $25 booking fee will be added to all applicable mooring fees during regular weekends (see fee schedule below). Holiday weekends may incur additional booking fees, and include Memorial Day, 4th of July, Labor Day, and Buccaneer Days. Reservations require a 2 night minimum stay during regular weekends. Holiday weekends require a three day minimum booking. The Harbor Department can extend your stay in Two Harbors after check in. 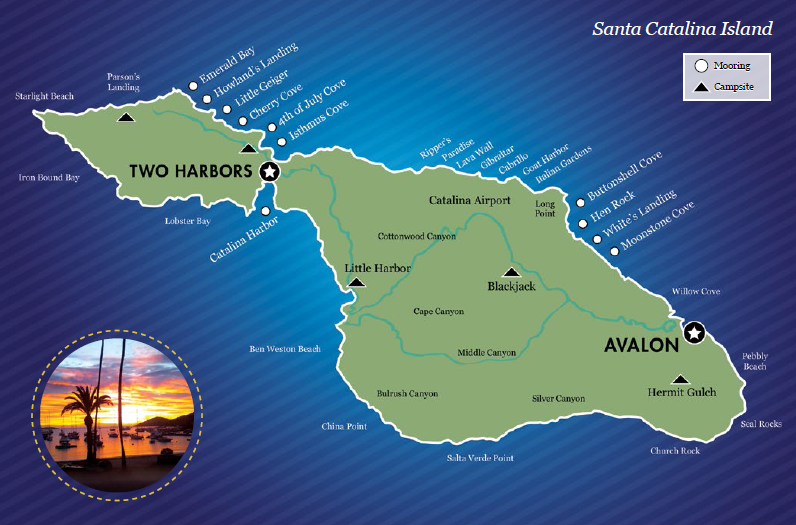 Reservations are non-refundable and guarantee a mooring within a specific cove. The Harbor Department reserves the right to reassign your mooring at any time. The reservation system opens on Thursday evenings at 8 PM and will be available until the following Monday. This system can be used for the coming weekend only. Any requests for dates outside of this window will need to be submitted the Thursday evening just preceding your visit. Note: Fees are based on size of boat that the mooring can accommodate. Check-out is 8:00 am. Late check-out available for an additional fee.